Lowdown: A policeman killed in the line of duty gets a second chance at restoring law and order. When we hear of comics based movies we automatically think superheroes. It's a knee jerk reaction type thing caused by years of film studio based training. However, there is more to comics than superheroes, and some times one of those gets its break to the big screen. 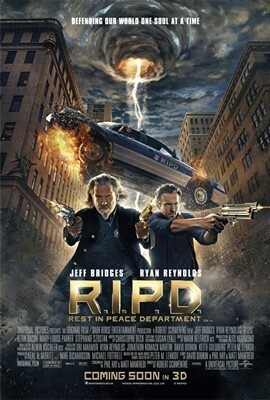 R.I.P.D., or Rest in Peace Department, is one such case, based on a Dark Horse comic. We follow Nick (Ryan Reynolds), a police detective, as he is betrayed by his partner (Kevin Bacon) during a police raid and shot dead. Only that he doesn't: he gets to go to a sort of a heavenly limbo, the Rest in Peace police department, that's in charge of ridding our earth from the dead creatures coming back to haunt it. There he is partnered with a western era law enforcer, Roy (Jeff Bridges). However, while the relationship between Nick and Roy develops along lines well established since Lethal Weapon, Nick is more interested in providing closure to his mourning girlfriend. As it turns out, his interest in his girlfriend, his treacherous ex partner and his current line of duty all line up. Now it's up to our dead detective to save the living. The last thing one can say about R.I.P.D. is that it's a serious film. R.I.P.D. is fun from start to finish, a movie that clearly goes for the bizarre humour at every opportunity (check out the way our two dead detectives appear to the living to see what I'm talking about). It is also clear the actors had much fun with this one, specifically Bridges. To him R.I.P.D. must have represented an opportunity to divulge into his country music hobby and murmur unclearly for the duration of an entire movie. Short and sweet, R.I.P.D. is an imaginative take on a familiar formula. It is not the most exceptional movie ever, but it definitely is fun. Overall: I'd love to see more comics like this brought over to the big screen. 3 out of 5 crabs.